UK Bookmaker Netbet has just introduced a Partial Cash Out feature, available on all sports betting markets, including horse racing. 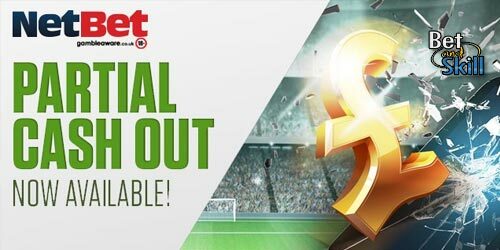 Find here how to use the partially Cash Out your bets at Netbet! Why you should use the Cash Out and Partial Cash Out feature? Guarantee a return while still letting your bet run for more possible winnings! Also available on mobile for single and accumulator bets! Partial ‘Cash Out’ puts the power in players' hands. You now have complete control of your bets as you can collect part of your winnings BEFORE the event has ended. What can I use Cash Out on? 1. Usual Cash Out terms apply. 2. Cash Out will not be available when a permutation/system bet is placed. For example three selections from four, four selections from five etc. 3. NetBet offer Partial Cash Out for Web and Mobile. 4. The minimum Partial Cash Out amount for singles is the minimum bet that can be placed on the event. 5. If the Cash Out amount is lower than twice the minimum bet, NetBet do not offer the Partial Cash Out. 6. The maximum Partial Cash Out amount a customer can make is equal to the full Cash Out minus the minimum bet on offer. "Partial cashout now available at Netbet - also on mobile"